MICHELLE Obama and her teen daughters will visit Liberia, Morocco and Spain at the end of June. The First Lady will travel with daughters Malia and Sasha to promote education for girls, the White House has revealed. She will first visit a Peace corps training center in Kakata and a school in Unification Town to talk to young women about the challenges they face in trying to stay in school. She will then join Meryl Streep in Morocco on June 28 and 29 to discuss committments made by the US and Morocco to help girls to go to school. 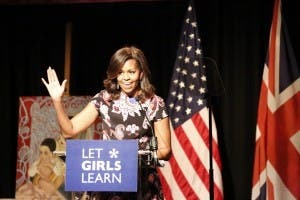 Michelle will round off her trip by giving a speech in Madrid about her Let Girls Learn global initiative, which hopes to harness government and private sector resources to promote education for girls. It’s not the first time the first family have visited Spain, having holidayed in Marbella and Ronda in 2010.